Sharapova has been solid for a full year. 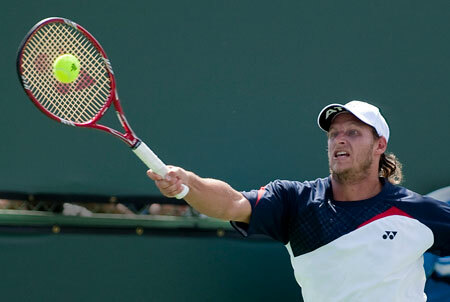 Perhaps the most defining element of the Sony Ericsson Open in Miami is that is a true end to a quarter of a season that begins at the start of the year in Australia and New Zealand and ends in South Florida on similar hard courts. So now all but six players have completed nearly three months of the year with two women and two men having gone out on Thursday, and a few more on Wednesday. The following is the rankings list that Matt Cronin contributed to the Tennis Channel for its current top 100 greatest players ever, (male and female combined), five-part series. Here is the the Tenis Channel’s final rankings, which is an average of the contributions by various experts. Here is mine. It’s important to note that this list was written nearly a year ago, before Novak Djokovic won three more Grand Slam titles. In a list written today, he would be in my top 40, at least. I did take into account doubles contributions, but to me this is primarily a list of great singles players, so I weighed singles more heavily. Andy finally got over on Federer again. After knocking back three break points down 0-1 in the third set of his somewhat shocking 7-6(4), 1-6, 6-4 over Roger Federer in Miami, Andy Roddick went out in third game and all of sudden after nearly a full year and three quarters of looking a slower due to injuries, he ran with sheer abandon. He earned a break point, and then dashed to his right and retrieved a forehand crosscourt volley. With the quick flick of his wrist, he curled a gorgeous forehand down the line pass that stunned the Swiss. That was the moment when he picked up his career again, and whether it lasts another week, month, or two years, he was finally rewarded for the relentless yet frustrating rehab work he has put in since his great run to the 2009 Wimbledon final, when Federer found a way to wear him down mentally him in a five set classic. “That was one of the best return games I have ever played,” Roddick said. The 31st seed’s victory did not come easily at the end, when Federer out smacked him in a tough forehand-to-forehand rally to gain a 30-15 edge at 5-4. So what did Roddick do? What the old Andy would have done, and this time he succeeded against the Swiss: he nailed an ace and then two service winners, not allowing Federer to trip him up in a rally. It was just Roddick’s third win in 24 career meetings with Federer, but two of his wins over the 16-time Slam champ have come at Crandon Park on Key Biscayne. 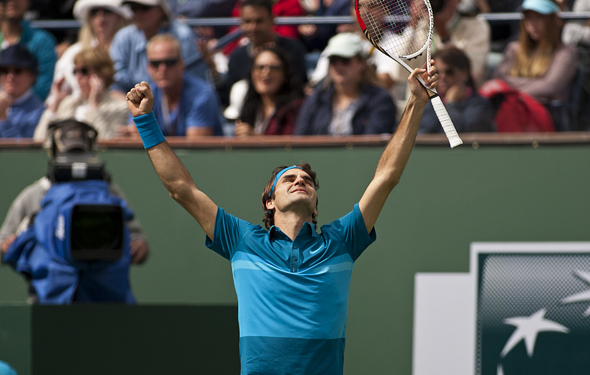 It is somewhat hard to recall the last time he played that well against an elite player and actually won the match. His win over David Ferrer at the 2011 US Open showed his grit on a back court, but it was not a victory over a guy who has totally owned him and was on a 16-match win streak, which included titles in Rotterdam, Dubai and Indian Wells. It was very likely when Nadal knocked out Rafael Nadal at 2009 Miami, a tournament where he has often times played his best. Roddick played as about as aggressively as he could: he did not allow Federer to push him around on the forehand side or trick him into absurd net approaches. He looked like the boss and while the win will not allow him to sleep easy for the rest of his life and not think about his Wimbledon defeat, it will make a very happy man in the short term, and also signals that he can be a relevant player again. Victoria Azarenka d. Dominika Cibulkova 1-6 7-6 7-5. The victory was Azarenka’s 26th straight, but the contest was the Slovak’s to take, as she held a 2 break lead in the 2nd set. The new Vika was gutsy and clutch, while her old foe from the juniors, Cibulkova, once again failed to show that she has the mentality to be a top 5 player. Stosur looked in control of the match early on, but a nervous Serena finally began to take high hopping balls to her backhand early and came away with a small measure of revenge for her 2011 US Open loss to her. Sharapova cannot always beat the rest of the top five with her “B” game, but she gutted this one out even though she was way off her top level, as was Makarova. She better up her game quickly as Li Na, who bested her at 2011 RG, is next, and nemesis Serena looms. Caro has not been so far under the radar since early 2009 publicity wise, but that will change as she will face Serena, who took her out at the 2011 US Open. She’ll take her to at least 3 sets this time around. It’s so hard to figure Li and when she’ll will have a mental check out, but the surface and whether suits her and one would expect her to give Sharapova hell. Lisicki is stuck in place. If you are a Spanish rookie do you really want to face the white witch of the WTA? I think not, but Muguruza made major strides this week. And Aga, well if she doesn’t face Azarenka she has a good chance to win her sixth high grade outdoor hardcourt title in the past eight months. All respect to Marion, but Kirilenko must have been sick or hurt here as she’s been playing way better than this score. Let’s see if Bartoli can go at Azarenka in the same fashion that Cibulkova did. This use to be a super relevant match between up and comers, but Cilic is barely relevant any more. Delpo is promising better play than he showed against Ferrer in Davis Cup. Ferrer rarely loses early, on any surface, but does anyone actually see him reaching the final? What was that, the 1000th time Djokovic has defeated Troicki? Do you realize that these days you can actually say that Gasquet does things quietly – like winning. This is the first time this year that Fish has dug himself into a tournament. 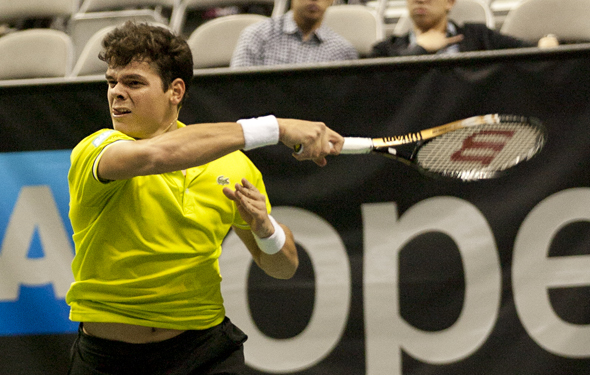 If he wants to move to Center court, he is going to need to be very focused vs. Almagro. Andy Murray does not need to win Miami to regain the huge amount of confidence he gained from terrific play at the Australian Open and at Dubai, but after his early exit at Indian Wells, he does need to go fairly deep and that means finding a way to fend off Milos Raonic, who is going to come at him hard and often. FROM THE BNP PARIBAS OPEN AT INDIAN WELLS – Victoria Azarenka is beginning to lap the WTA field and if you consider where she was at this time last year, it’s pretty shocking. On Sunday, Azarenka pummeled three-time Grand Slam champion Maria Sharapova again, this time 6-2, 6-3 to win her first BNP Paribas Open title at Indian Wells and collect a cool $1 million. Last year in the California desert, she was forced to retire with an injury against her close friend Caroline Wozniacki, which at the time added to her reputation of a somewhat unfit, frequently injured player who would never be able to reach No. 1 because she could never pay consistently enough to achieve it. TennisReporters.net is now taking subscriptions for exclusive stories sent via e-mail. We will send you at least 50 stories a year along with breaking news notifications. It is still unclear whether after a terrific last six months whether Roger Federer will find away to win a Grand Slam again. But, without question, after winning his fifth title in his last six tournaments with a 7-6 (7) 6-3 victory over John Isner on Sunday in the final of the BNP Paribas Open at Indian Wells, he showed that he is capable of it. The Swiss came into the tournament nursing a bad case of the flu and left it with his fourth Indian Wells crown, beating not only the red hot Isner – who had stunned Novak Djokovic in the semis – but also scoring only his second career outdoor hard court win over his nemesis, Rafael Nadal in the semis. This version of Federer more closely resembled the great Roger of 2004-2008: fast, smart, on top of the ball in the blink of an eye, dictating with an iron fist, defending with an iron will, and sure of his ability to come through in the end. Even though he was fighting a fever, he also chopped down three big men in Milos Raonic, Tomas Bellucci and Juan Martin del Potro. It was Federer’s first outdoor hard court Masters Series title since 2010 Cincinnati, not eons ago, but long enough for a man who now owns 73 titles overall and 19 Masters crowns. 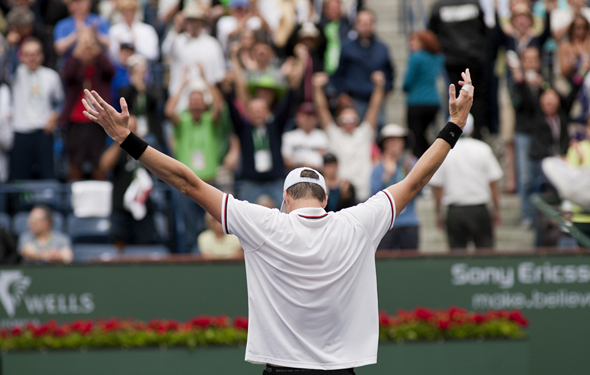 FROM THE BNP PARIBAS OPEN AT INDIAN WELLS – John Isner pulled off the biggest hard court victory of his career in stopping No. 1 Novak Djokovic 7-6 (7), 3-6, 7-6 (5) in the semifinals and now will know that when the rankings are released next week he will finally crack the top 10.